Gluten uniquely holds three characteristics important to bread making: elasticity, viscosity and extensibility. Although most of the buzz these days is how to take gluten OUT of food, it’s important to understand why you need it IN dough, and how to fully optimize it. The elasticity comes from hydrogen bonds and entropy inside the gluten molecule — giving dough its springy texture. The extensibility allows the dough to stretch without breaking. Gluten’s viscosity is evident when the dough relaxes. The gluten flows, repelled by its hydrophobicity. 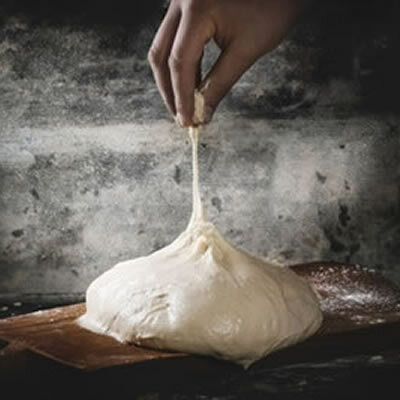 These characteristics help with dough strength, texture, stabilization, water absorption, flavor, and retention of gases during the rising stage. What are wheat protein isolates? Bring on the gluten boost! All of this is occurring naturally inside dough when wheat, rye or triticale is used. However, some products need an extra boost. For example, the bran in whole wheat flours can break down gluten structure. Vital gluten is condensed wheat gluten and has a high protein percentage (around 73%).